There must be anarchy, there must be – if the revolution is to become and remain alive, real, and powerful – the greatest possible awakening of all the local passions and aspirations; a tremendous awakening of spontaneous life everywhere. … la morale se présente comme un ensemble de règles contraignantes d'un type spécial, qui consiste à juger des actions et des intentions en les rapportant à des valeurs transcendantes (c'est bien, c'est mal…); l'ethique est un ensemble de règles facultatives qui evaluent ce que nous faisons, ce que nous disons, d'après le mode d'existence que cela implique. 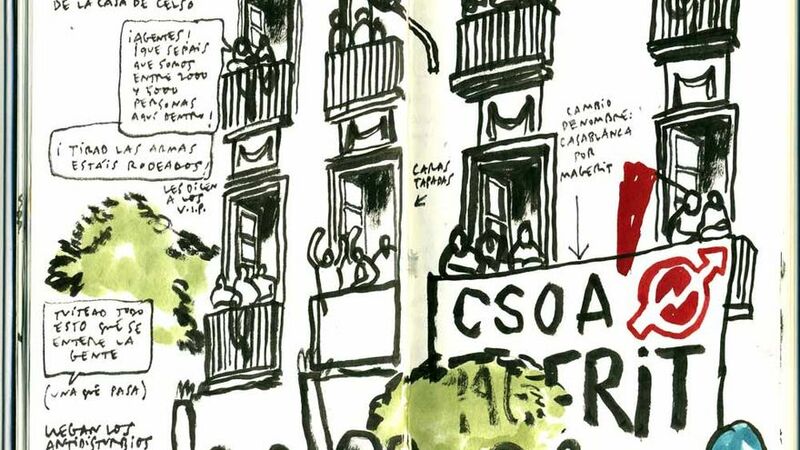 For five hours (12/10/2012), the Okupied and Self-managed Social Centre Magerit rekindled the life of the CSOA Casablanca, Madrid; an effort to retake and relive the space/time of revolution which was the daily stuff of Casablanca. Following on a gathering to celebrate and protest against the theft of the library collection (10,000 volumes) of the Biblioteca Sol, lost with Casablanca (19/09/2012), the protest marched from the plaza de Lavapies to the former okupation, where a few dozen bypassed the bricked up entrance, going through the windows and declaring the opening of a new okupied social centre. … meanwhile, some 5 million people are without work, while for those who work, a third earn less or the equivalent of the national minimum wage (641.40 Euros) (Rebelion), 600,000 households have lost their homes since 2008 (Kaos en la red) and spain is now the country of the Eurozone with the greatest social inequality (elpais). And those responsable for this violence, politicians and company owners/managers, remain free of State violence. The neighbours of Lavapiés inaugurated today a space that, a few days ago, we liberated in he neighbourhood. This decision emerged from the necessity that we have of a space in which we can meet and in which we can realise our social life. We believe tht it is necessary for people to have such spaces where they can construct their lives freely and collectively. This is what we intend with the inauguration of Okupied and Self-managed Social Centre Magerit. The reasons for us having chosen this space have to do with the situation that we currently live. The economic and social crisis in which we find ourselves was driven in large part by the greed of those who are playing with our lives. Urban speculation (of which this space is a clear example) has effected a fundamental part of peoples lives: housing, thus reaching the whole of the social fabric. Construction and real estate companies, banks etc. (with the benediction of political and party elites) are those responsable for our not having homes, for the increasing costs in education, the reduction in unemployment benefits, the end of fundamental rights – health, freedom of expression. …In freeing this space from speculation, we want to construct in it, together with many people, are real alternative to this world ever more uninhabitable. We want this new space to be open to all the people of the neighbourhood, of the city and of all parts, to which we invite to participate. Come and discover what is behind the door … come and make it. Las vecinas y vecinos de Lavapiés inauguramos hoy un espacio que, hace unos días, hemos liberado en el barrio. Esta decisión ha surgido de la necesidad que tenemos de un espacio en que poder encontrarnos y llevar a cabo nuestra vida social. Creemos que es necesidad de las personas contar con espacios donde poder construir nuestra vida de forma libre y colectiva. Esto es lo que pretendemos con la inauguración del nuevo Centro Social Okupado y Autogestionado Magerit. Las razones que nos han llevado a elegir este lugar tienen que ver con la situación que vivimos actualmente. La crisis económica y social en la que nos encontramos ha sido motivada en gran medida por la codicia de quienes están jugando con nuestras vidas. La especulación urbanística (de la que este espacio es un claro ejemplo) ha afectado a una parte fundamental de la vida de las personas: la vivienda, desde donde ha llegado a todo el tejido social. Las constructoras, inmobiliarias, bancos, etc (con el beneplácito de las élites políticas y partitocráticas) son los culpables de que ahora no tengamos viviendas, de que la educación se haya encarecido, las prestaciones por desempleo reducidas, del fin de los derechos fundamentales –salud, libertad de expresión…. Al liberar este espacio de la especulación, queremos poder construir en él, junto a mucha gente, una alternativa real a este mundo cada vez más inhabitable. Queremos que este nuevo espacio esté abierto a todas las personas del barrio, de la ciudad y de todas partes, a las que invitamos a participar. Vengan a descubrir lo que hay tras esta puerta… vengan a construirlo. The CSOA Magerit was an effort to take back the lost CSOA Casablanca and in this manner defy the time of the State, a time measured by progress and regress, replaced by a timeless present, but not of eternity, but of an eternal return, which though a return, is a return in the present, and therefore never the same … Casablanca metamorphosised into Magerit. The resonances of 15M have perhaps weakened, barriers have filtered and fractured them, barriers erected both by the State and the "traditional" left, fearful of loosing skeletal monopolies. The coal miners strike earler this year, the CC.OO/UGT led workers protests, the SAT marches in Andalucia, the effort to surround the spanish congress in September have all, at different times, been held up as counter examples of proper anti-capitalist militancy. 15M is described as light politics, insufficiently radical, too fearful of real opposition to the system … between the lines, unmanly. (An interview with spanish activist Juan Gutierrez is revealling in this regard. See: eldiario.es). Yet however important the aformentioned protests have been (for their passion, for their ability to shatter false consensuses, for the examples they set of courage), they have left very little in their wake. When not domesticated by institutionalised and conservative labour unions (I exclude the SAT in this regard), little remains and continues beyond the days of protest. The gesture of reclaiming/remaking Casablanca points to a much more radical understanding of rebellion, which however ephemeral and inefficacious as measured by productivist time, marks those who share in its' actuality. As the State-Capital are everywhere, revolution must itself be total and permanent, lived in every gesture, constutite a form of life, a way of being. Okupations can and should be an intrinsic part of such processes, as well as all manner of other creations which counter/bypass/contest the hegemony of State-Captal. Okupations can take the form of urban Okupied Social Centres, okupations of residential housing units (and many today take place without publicity in spain – Kaos en la red), rural okupations, as well as resistance to evictions. In all of these instances, an appropriation of private wealth, more often than not subsidised by public monies and in the midst of general capitalist exploitation is more than justified. El 15 de octubre, después de la manifestación del 15-M, bajo el lema “De la indignación a la acción” ocupamos el edificio de la calle Almagro 2-4 junto con diez familias desahuciadas o desalojadas. El Edifici 15o es propiedad de Cajamar, así que una vez más nos encontramos ante otro edificio vacío en manos de la banca. El edificio ocupado cumplirá la función de vivienda para estas familias y, además, contará con un espacio social para el barrio en los bajos de la finca, donde se realizarán cooperativas de trabajo y talleres autogestionados. La crisis avanza y la pobreza crece. Cada día más personas dejan de pagar sus hipotecas y alquileres por no tener trabajo ni recursos, y cada vez somos más las que nos quedamos sin vivienda. Hablamos de más de 300 desahucios diarios y Nou Barris es el distrito más afectado por esta situación. Ante la inoperancia de las instituciones y los servicios sociales, cualquier medida como esta es, además de necesaria, totalmente legítima. Porque no hay derecho de que haya tanta gente sin casa y tantas casas sin gente. Y por todo esto os invitamos a participar de esta lucha que nos afecta a todos y todas. Es el momento de unirnos y solidarizarnos. Por el derecho a una vivienda digna, no más desalojos y no más desahucios!!! No somos mercancía en manos de políticos y banqueros!!! La lucha nos da lo que el poder nos quita!!! No one imagines that such efforts can destroy the State-Capital. But equally difficult to understand is how revolution is possible without such spaces of autonomy, spaces which in turn sustain more immediate protests. And when paralleled by efforts to create alternative economies (time banks alone as alternative systems of exchange number over 300 in spain, with thousands of people involved, and all of this created since May 2011 – see theguardian), it can be said of 15M and sister contemporary movements that they make up one of the most radical challenges to capitalism anywhere. (See also the efforts to create a network self-managemed organisations in Madrid … tomamadrid). Bakunin once wrote that what "we mean by revolution is an outburst of what today is called "evil passions" and the destruction of the so called public order." The image is one of violence, but the passions called forth here by Bakunin are the passions of freedom, of friendship and love, of equality and solidarity, passions which cannot but be opposed to public order. The beauty of much that 15M has given life to goes beyond 15M, understood as a social movement; it is the making actual of possibilities, possibilities of transgression of moral and legal norms, an openning onto ways of being with others and the world that defy utilitarian rationality. There are those who would wish to restrain it, or to see it simply pass away. And it may. But should it continue, and however it does, it will be through passions, for revolution is an ethical passion that is morally evil. This entry was posted in Commentary, News blog and tagged 15M, Okupations, spain, Spanish Revolution. Bookmark the permalink.